MINNEAPOLIS, Minn. – Jan. 30, 2008 – Capstone Publishers is launching a network version of the Capstone Interactive LibraryTM for use in entire schools, districts, and library systems. First introduced in January 2007 as an innovative way to improve reading skills with young learners, the Capstone Interactive Library has grown to nearly 200 titles, including many in bilingual format. To expand learning and engagement, Capstone Publishers designed a free companion Web site for the Capstone Interactive Library at www.capstonekids.com. The site includes educational activities, online quizzes, links to the Interactive books, and many Capstone Publishers topics and characters. The Capstone Interactive Library is compatible with any computer or interactive whiteboard, including Promethean Activeboard, SMART board, eBeam, Mimio, and Webster. Customers interested in a trial version of the Capstone Interactive Library should contact their local direct sales representative by calling customer service at 800-747-4992 or by visiting any Capstone Publishers Web site and using the Sales Rep Locator tool. #1 (of 4): In the tradition of X-Men Fairy Tales, Marvel makes its move on melding more modern myths, starting with Spider-Man! Our friendly neighborhood becomes a quaint village and Mary Jane fills the shoes of another famous red-head in this premiere issue as the tale of Little Red Riding Hood is retold with super hero sensibilities! Will Spider-Man be able to save her on her way to Aunt May's house? And just who is our Big Bad Wolf? Find out just how fun fairy tales can be... Marvel style! #2 (of 4): The legend of Kwaku Anansi, the First Spider, melds with the Marvel Universe as Anansi learns a valuable lesson about power and responsibility. On his quest for the legendary Spider-Orchid, Anansi is challenged by four elemental beings who seek to stop him from reaching his goal. Will Anansi be able to overcome the villainous forces of air, water, sand and fire to complete his journey and take his next steps in life? #3 (of 4): Spider-Man Fairy Tales continues with a retelling of Spider-Man's origin, fusing one of Marvel's most classic stories with a number of popular Japanese ghost stories and legends! After the death of his parents, a young Buddhist monk is taken in by his elderly aunt and uncle and has since enjoyed a peaceful life away from further pain and suffering in a secluded temple. But when an evil "tsuchigumo," or spider spirit, attacks and bites the young boy, he finds he's gained tremendous abilities, which he must now use to save his temple from six sinister ghostly invaders who have come for his blood. #4 (of 4): You've never seen a Cinderella story like this one! In search of a husband for Princess Gwendolyn, a costume ball is thrown for the suitable young men of the Kingdom, but when the mysterious Spider Prince arrives, that's when the trouble begins. Who is this noble knight no one has ever heard of? What grudge do the soldiers in the Goblin Brigade hold against him? And just why does this dashing Spider Prince need to depart before midnight? Will he fall victim to a pumpkin bomb? How do you tell old stories to a new and young audience without boring the kids to death? Marvel’s recipe mixes four cups of traditional fairy tales with 1 pound of ground superhero. Mix thoroughly with hands, place in four different dishes and bake until nicely browned and solid to the touch. Each story is seasoned separately creating four distinct and creative dishes. Some work well and others seem a bit forced, but the outcome is interesting, energetic and fun. The first three issues are excellent. Those three stories fit their own fairy tale very well, yet they manage to maintain a strong Spider-Man flavor, delicious dishes all, whereas issue number four – the Cinderella story – was more like a dish of Brussels sprouts and beet soup served lukewarm. One poor dish, among three great ones, is a percentage I am willing to accept. I think kids will too. In fact, I think kids will devour these modern superhero fairy tales and ask for seconds. The art review is similar to the story review in that the first three issues were expertly crafted. The art is stylized and varied; it is not the traditional comic fare. Each issue has its own feel, which is characteristic of the story. Issue 4 is drawn with a more conservative and traditional eye, which is fine, but not really fitting for the subject. I would have liked to seen the artist take a risk more in line with issues 1-3. Fairy tales have monsters and death and scary things. Marvel’s SPIDER-MAN FAIRY TALES is no different. Kids frequently study fairy tales and so these have an automatic place in the classroom: elementary, middle and even high school. These tales are rooted in different cultures giving the teacher a chance to easily and seamlessly incorporate a multicultural discussion without forcing the issue into the curriculum or being forced to talk only during specific ethnic monthly holidays or celebrations. If there is a better way to incorporate cultural education, I do not know about it. Another similar title is X-MEN FAIRY TALES issues 1-4. It is rumored that Marvel will also publish an AVENGERS FAIRY TALES series. The individual SPIDER-MAN FAIRY TALES (and the X-MEN series too) are available in a trade paperback. 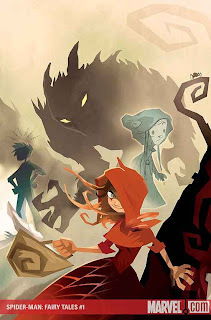 Allowing kids to explore the fairy tale in new and exciting ways helps them appreciate traditional literature and also expands their knowledge and ability to see the connections between old and new. Not only is this series fun, it is educational and practical. Thomas J. Hanson, editor of OPEN EDUCATION, recently interviewed THE GRAPHIC CLASSROOM for a series of three articles on using comic literature in the classroom. The first article, “Innovative Teaching – Comic Books in the Classroom,” introduces the subject of comic literature in the classroom. The second article, “Innovative Teaching – Chris Wilson Discusses the Comic Book Movement,” is an in-depth interview of yours truly about the philosophy behind using comic literature. The third article "The Twelve Best Comics for the Classroom" is a listing of suggested comics to use in the classroom. Tom did a good job on his research and presented an excellent series of articles. This is a great educational blog, with articles posted at break-neck speed. Check early and often to keep up on new trends in the field. The world of comic literature is an ever-growing, ever-evolving, genre. Every month there are exciting titles hitting the market. It is simply amazing. There are so many new books scheduled to hit the shelves this year. I’ve received several catalogs from publishers and I am overjoyed at the varied titles. A number of exciting books came in this week. Scholastic and Papercutz are two comic literature publishers that deserve a watchful eye. Both of these groups are focused on putting out graphic novels for the young reader. They are not the only ones doing great things. I’ll keep you posted. The nonfiction buffs will rejoice at the number of biographies and science-based titles listed. Persons representing different cultures, fighters of freedom and equality for others, and inventors and presidents are all represented. 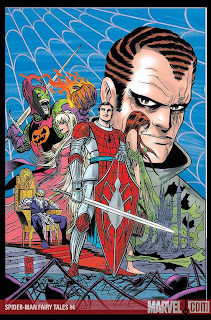 cover of the graphic novel looks similar. Persepolis is the poignant story of a young girl in Iran during the Islamic Revolution. It is th Marjane that we see a people's hopes dashed as fundamentalists take power - forcing the veil on women and imprisoning thousands. Clever and fearless, she outsmarts the “social guardians” and discovers punk. Yet when her uncle is senselessly executed and as bombs fall around Tehran in the Iran/Iraq war, the daily fear that permeates life in Iran is palpable. As she gets older, Marjane's boldness causes her parents to worry over her continued safety. And so, at age fourteen, they make the difficult decision to send her to school in Austria. Vulnerable and alone in a strange land, she endures the typical ordeals of a teenager. Over time, she gains acceptance, and even experiences love, but after high school she finds herself alone and horribly homesick. 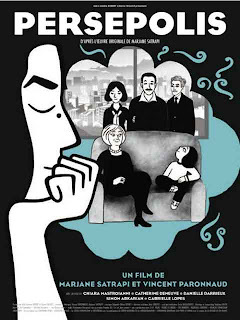 Marjane Satrapi’s graphic novels Persepolis: the Story of a Childhood (Pantheon, 2003, English version) and Persepolis 2: the Story of a Return (Pantheon, 2004, English version) won widespread acclaim in France, now her home, and around the world. Now, she has co-directed, with Vincent Paronnaud, the animated film version of her memoir. The title PERSEPOLIS comes from the Persian capital founded in the 6th century BC by Darius I, later destroyed by Alexander the Great. It’s a reminder that there’s an old and grand civilization, besieged by waves of invaders but carrying on through milennia, that is much deeper and more complex than the current-day view of Iran as a monoculture of fundamentalism, fanaticism, and terrorism. Undoubtedly, the graphic novel world is growing and comic literature is being accepted for its literary value. There is an educational opportunity with this graphic novel and movie to explore the world of Iran through one of its young people. The target audience Your guess is as good as mine as what age group this is appropriate for. The movie is PG-13. Again, I haven’t read the book and I haven’t seen the film. Classics Illustrated is back! Starting in 1941, these graphic novels became very popular. They introduced abridged versions of traditional literature. The successful line of comics is back, thanks to Papercutz, starting with THE WIND IN THE WILLOWS. Should be fun. Speaking of traditional literature, Marvel is continuing in its miniseries of traditional literature, this time with THE ILIAD and THE PICTURE OF DORIAN GRAY. If Marvel continues the trend, then eventually these will be collected into one volume. You may notice that I have listed THE MANGA BIBLE on the list this week. I think it is very appropriate to talk about religion in the classroom, and Jeremy Gunn, of the ACLU, agreed in his speech at Missouri State University in 2007 when he talked about the role of religion in the 21st century public school. His opinion was that religion can be and should taught in schools so long as the discussion is academic and the teacher does not promote any religion or non-religion. I do not know if this version is appropriate for children, but I do hope to collect graphic novels on various religions or religious persons and make them available in my classroom, if students wish to read them. I will not, however, push, promote, or punish based on any religion or absence of religion. I hear tell there is a book on Buddha coming out soon and I would love to get my hands on it too. The three Bone cousins, Fone Bone, Phoney Bone, and Smiley Bone, are run out of Boneville. They become separated and find themselves alone in the uncharted desert, and each manage to make their way into a forest inhabited by strange creatures. There the adventures begin! Kids and adults alike will immensely enjoy this fantasy-humor comic adventure. After visiting the village of Barrelhaven, Fone Bone and his cousins plan to return home. But then Phoney decides to go after one more get-rich-quick opportunity during the town's annual Great Cow Race and, of course, fails disastrously. Just when it seems they'll finally make it home, ominous signs appear that a war is brewing. Can Fone help his friends defend their territory? Lucius, Smiley, and Phoney survive an attack by the rat creatures and return safely to Lucius' tavern in Barrelhaven. Phoney, desperate to win a bet with Lucius, stokes the townspeople's fear of dragons and boasts that he is a professional dragonslayer. Back at the farm, Fone Bone and Thorn are troubled by strange dreams, and Gran'ma Ben's reaction to them is stranger still: She reveals long-kept secrets and warns of great danger. Thorn, Fone Bone, and Gran'ma Ben may have to leave the farm forever. Fone Bone confronts a host of dangers in Book 4 of the BONE saga, "The Dragonslayer". He and Gran'ma Ben and Thorn have a terrifying encounter with Kingdok, ruler of the rat creatures. The Hooded One is inciting his army to full-scale war. Someone is continuing to haunt Thorn in her dreams. And then wise Gran'ma Ben disappears. To make matters worse, Phoney Bone has hoodwinked the townspeople into believing that he is a mighty dragonslayer. When he actually does catch the Red Dragon — much to his surprise — he must face up to his promise: to slay the dragon at sunrise. Fone and Smiley Bone strike out into the wilderness to return a lost rat creature cub to the mountains. It doesn't take long before they run smack into Rock Jaw, "Master of the Eastern Border," an enormous mountain lion with a none-too-friendly disposition. Life gets even more complicated when they befriend a group of baby animals who are being orphaned by rat creature attacks. 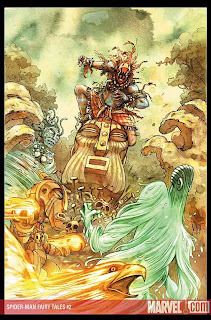 Everything comes to a head in an earth-shattering clash between Rock Jaw and Kingdok, the leader of the rat creatures. As war spreads through the valley, the Bone cousins join Gran'ma Ben and Lucius at Old Man's Cave to make a stand against the rat creatures, but not everything goes as planned. By the end of the book, Phoney Bone is strapped to a stone altar and about to be sacrificed; Thorn is lying lifeless nearby; and the rumblings of an earthquake suggest that the Lord of the Locusts is about to be released. Fone and Smiley Bone must do something drastic to save their friends. The mysterious Ghost Circles start showing up creating voids in the world. Thorn, the Bones, and Gran’ma head for the ancient city of Atheia, while battling rat creatures, The Hooded One, and Rock Jaw are on the way. The townsfolk, with the help of Lucius, resist the leadership of the stick-eaters. Thorn and company make it to Atheia and right off the bat, Phoney is plotting to find and make off with the local treasure, which has been hidden by the town leader. Gran’ma reconnects with an old friend and together they plan a coup to take back the city and restore power to the rightful heirs. This is the final installment of the Bone series. The Hooded One and her army make it to Atheia and battle ensues. Thorn finally understands her role and seeks her own path to save the people, aided by a few friends. Things get pretty hairy and … well you will just have to read it for yourself. I can sum up this review in three words: Bone is bad. (bad, of course, meaning “good”.) In Bone’s case it could also mean great. Rarely do we find a comic opus for children, but Bone is it. The characters are well developed, well thought out, are expertly crafted. They are flawed and confused, but find their own path in the end. Smith takes great care with his craft, making sure the drive for the story remains squarely on the characters rather than action. Ultimately, that is what makes BONE great. It is not just a comic action-adventure saga, but a wonderful story which happens to be told with sequential art. The art is a nice compromise between realistic and cartoon illustrations. The panels flow and help drive the story. It is amazingly how much emotion that Smith is able to create with his characters, especially the Bone cousins. Beautiful. Since I started writing reviews for using graphic novels in the classroom I have heard nothing but praise for BONE, but something kept me away. The first printings of BONE were rendered in black and white, and it put me off, which is exactly what I suspect will happen with kids. Then Graphix picked up the book and ran with it, seeing what needed to be done. Now we have the color editions. A smart move to be sure as the title resonates more now than ever before. I have a black and white BONE anthology at home and I have compared the two. For this review, the last three chapters of the series were read using my old black and white anthology. The color made all the difference for me, as it will for children. Scholastic’s imprint, Graphix, rated this epic for grades 6-9. However, another article on scholastic had it rated for ages 8-12. It is a complex yarn with multiple story lines and an important history. The text is not dumbed down nor the characters squeaky clean. Yet, I cannot help wondering why the middle school rating. I think BONE is appropriate for kids younger than sixth grade. If second and third graders can read HARRY POTTER and SPIDER-MAN – and they do – then they can and should read BONE. 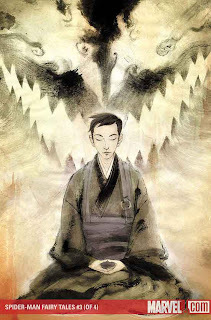 BONE is a fantasy graphic novel with some mild violence, creatures, and magic. If you like HARRY POTTER or THE HOBBIT, then this is right up your alley. If you object to those same titles, then you may object to BONE too. Comprised of more than 1,300 pages, BONE is an epic graphic novel for kids. It can used for so many things. I could go on and on about how to use BONE in the classroom, but Graphix has done that for me. That’s right. Graphix has produced a guide for teachers and librarians using BONE called “Using Graphic Novels with Children and Teens”. This piece explores how BONE compares to classical mythology, as well as the allusions to American literature and film. It also outlines how to read comics and even makes the case for comics to be used in classrooms. Click here to download USING GRAPHIC NOVELS WITH CHILDREN AND TEENS. At the time of this publication, books 1-6 were available, but books 7-9 were still in production. I read all 6 of the first books from Scholastic, then I finished the story from an older, black and white anthology, previously published. The story and art is the same; the format and color are different. Get these books for your classroom and promote them with your students. When you buy them, be sure to purchase the versions from Graphix because they are in color and students will be more attracted and willing to read them, especially considering the huge amount of pages. The nice thing about the Graphix editions is that they are split up into nine different books, rather than one anthology, making the series less intimidating and easier to hold. Todd Kent, a movie producer/director from Dallas, is looking for some teachers or librarians that use comic literature in schools to promote literacy and education for an upcoming documentary. If you have a story to tell about using comic literature, then here is your chance. I am contacting you because I am on the lookout for teachers, librarians and other educators who might utlize comics for educational purposes (reading, lesson planning, language skills, etc.). I am hoping to find some programs and/or success stories to show in the film. If you are aware of anything of this type, I would appreciate any information. Additionally please feel free to forward my information on to anyone you think might be interested in telling their story. Thank you and please feel free to contact me at any time. So he did. I know these boys because I frequently substitute in their class. It is an eMINTS classroom and I am one of the only substitutes in the entire city who is working on his eMINTS certification. I stopped and the young scholar pulled out a copy of THE 9-11 REPORT: A GRAPHIC ADAPTATION! Holy civil engagement, Batman! To my amazement, this 10-year-old boy had gone to the county library and checked out THE 9-11 REPORT. He proudly told me that he had already read some of it and it was great. The kids in this school know that Mr. Wilson is into comics. They know it because when I teach, I tend to take one with me. Just testing the waters is all. This boy was so proud to tell me that he was reading a comic. It meant something to him. Quite frankly, I would have suspected the reading level to be a bit high for him. I was wrong. Today, I am proud to be a teacher who promotes the use of comics in the classroom. It can make a difference. Amelia’s story continues in these next two volumes in the hit, all-ages series. Reggie leads his band of pint-sized super heroes to battle against the Ninjas across town and the Legion of Steves. Amelia gets caught up in a kiss that would make Shakespeare proud. All the while, the hardships of the real world keep coming and Amelia makes her way through it with the help of those around her. He has an ability to create levels of storytelling through a coupling of art and writing that is amazing in its simultaneous simplicity and depth. He understands children and their views of the world in a way that many writers, teachers and parents just cannot realize. Good literature is relevant to readers generation after generation, and even though Gowley fills his stories with pop culture references, his work will stand up over the years. This is because the story is not really about ninjas or VH1. AMELIA RULES! is about the life and times of youth: their carefree summer afternoons spent playing with friends and the internal struggles of life. This story is universal and transcends any current cultural references, and this is what makes it great. AMELIA RULES! succeeds where other books do not in that Gownley is able to tap into the real life of kids without being heavy handed or overwhelming. Amelia is very reflective but she does not understand the world from an adult perspective. She is a child and sees the world from her own young eyes. Lots of authors try to create a reflective protagonist, but instead end up with pages of tripe. Finding the balance and then maintaining it over three novels is a feat to behold. Like the bowl of porridge that Goldilocks finds in the bears’ home, Gownley’s story telling is neither too hot nor too cold; it is just right. AMELIA RULES! (the entire series) is an important title to have in an elementary classroom, especially in grades 3-6. The story is aimed at this age group of kids. The stories are relevant, exciting, interesting and powerful. AMELIA RULES! can be used across the curriculum and the stories allow children to make connections between their lives and the bigger community. Using Amelia’s point of view students can begin to see beyond themselves in a way that will make sense to them. At the same time, kids will be able to relate to Amelia and her wacky yet typical friends. Click here for the Economics Lesson Plan I designed using AMELIA RULES! 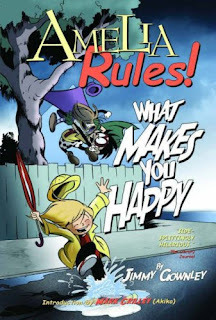 Click here to download the pdf of AMELIA RULES! “The Things I Cannot Change” for free. AMELIA RULES! is now available at the Scholastic school book fairs. This will be a special, 128 page, manga-sized book that will highlight the best AMELIA stories. It will sell for $4.99. Periodically I have people come around the classroom and ask about what books would be great for their child. I pull out certain titles and AMELIA RULES! is always among the pack. It is fantastic. It is one of the titles that my 7-year-old daughter loves to read over and over again. This is a comprehensive list of all the HIGHLY RECOMMENDED and RECOMMENDED comics that we have reviewed. It is categorized by grade level to help teachers and librarians pick the best comic literature for students. It is important to keep an open mind about grade levels. I caution you not to look only for graphic novels in your grade level. The books are listed according to the lowest age or grade level appropriate. However, a book listed in the ELEMENTARY: AGES 8-11 category may be very appropriate for middle school or even high school. For example, the many BEOWULF comics are categorized starting at elementary ages. However, these could also be used on the middle school and high school literature class as well. Keep an open mind. Check back because update will occur as often as possible. Rather than a review, I posted an article this week. That’s two in a row. If you have not checked out the interactive CD’s from Capstone Press, then you are missing out on a great way to use comics in the classroom. Be sure to check out the article. Next week the reviews will begin again. I used my Christmas break to write a lot of reviews and I have several in the pipe, which is a good thing because this semester is supposed to be the hardest one in my program. Not only do I have classes, but I am also completing an eight-week practicum in an elementary classroom. Not quite student teaching, but close to it. I am hoping that I will get the chance to write some lesson plans and use comics in the classroom. That all depends on my instructors and my supervising teacher. March would be a good time to introduce Spider-Man into your elementary classroom. Why? That is when the new SPECTACULAR SPIDER-MAN animated series debuts on The CW (which is part of the Kids’ WB). It will start with 16-year-jold Peter and his new found super powers. You can check out a preview over at the Kids WB. No word if there will be a comic book tie-in, but Marvel already puts out MARVEL ADVENTURES: SPIDER-MAN as part of its all-ages line. You may have noticed that the site has a new look. My friend, Shannon, created a logo for us, and we worked on the colors to make the site look more comic book friendly. Hat tip to Shannon for his hard work. We certainly appreciate him. As for the list, I only had one title trickle into the classroom this week, but it is one that I have been excited about. The use of comic books in the classroom is on the rise. More and more teachers are finding that comics can help reluctant readers learn to enjoy reading, something that schools many times do not pursue. Oh sure, schools push reading, but somehow the idea of reading for enjoy somehow escapes teachers, focused more on reading comprehension scores on standardized tests rather than teaching reading for reading’s sake. We can, of course, change all of that. But change does not come from politicians or school administrators. If real change is to occur, it must come from the teachers and make its way up the ladder. Click here to read the NY Times Editorial.